Explore Cuisine sent me several packages of their high-protein, gluten-free pastas to review. I've long been a fan of their stuff. Unlike some gluten-free pastas, Explore Cuisine's products boast a texture that isn't all that different from semolina pasta. Yet they're made with legumes, so they're loaded with protein! For this recipe, I chose the Red Lentil Spaghetti noodles, which have 11 grams of protein per serving and are made with red lentil flour and brown rice flour. They have a slightly nutty flavor, which is lovely. The recipe I'm sharing tonight is one I've been making at home for YEARS. Paul and I rarely cook together because he isn't really into cooking, but he does love sauteeing mushrooms. So this is one dish we can make together. I make the sauce and any other toppings, and he sautes the mushrooms. Below you'll find my super-simple recipe for spaghetti sauce. It's enough to cover about 4 servings of spaghetti (try the Explore Cuisine kind!). As for toppings, you can use whatever you like — vegan ground beef, mushrooms, Swiss chard (which I sauteed and used here), sliced vegan sausage, vegan meatballs, melted dairy-free mozz. The world is your spaghetti topping oyster! Only, that doesn't sound very vegan (forget the oyster part). By the way, you can see an older version of this recipe here on the blog. Since I've cut back on oil, I've amended it a bit! I also tend toward fresh herbs these days since I grow my own, but dried works in a pinch! Heat the oil in a large saucepan. Add the garlic and onion and cook and stir for 1 minute. Use your hands to break up the tomatoes from the can, and add them to the saucepan. If the sauce seems too dry, add a little liquid from a can of the tomatoes. You won't need all of the tomato liquid though. Just a splash from one can is plenty. Stir in the herbs and maple syrup and simmer for 15 minutes. Add the splash of red wine (a couple of tablespoons) and the salt and pepper, and cook for 5 minutes more. Remove from heat. For the month of June, I've subscribed to a weekly CSA from Bring It Food Hub, which sources produce from farmers across the Memphis area. When I signed up, I'd hoped the weekly bags would force me to re-think how I plan meals. Rather than pick out 5-6 recipes from cookbooks and then go to the store, I wanted to see what was in my CSA bag and then plan around that. I figured that would help me eat a wider variety of vegetables in the season when they're freshest. And it's worked! It's also helped me cut down on my grocery spending since I'm now only buying perishables and items I need for meals centered around the CSA veggies. Last week, on the Summer Solstice, I created this meal of Seitan Filets with Plum Sauce, Sauteed Green Beans, & Mushroom Barley Pilaf to use up some CSA plums, green beans, onion, and garlic. The seitan came from The BE-Hive, a vegan butcher in Nashville, and was gifted to me by my co-worker Gonzo after a recent trip over there. You can find the plum sauce recipe here. And those green beans were blanched and then sauteed in a skillet with the teensiest bit of sesame oil for flavor and Bragg's. The pilaf used onion and garlic from my CSA. I found an unopened bag of barley in my pantry that I'd apparently bought on sale months ago and forgotten about (there are LOTS of things in my pantry that I've forgotten about!). The only thing I had to buy for this meal were the mushrooms. The fresh herbs in the dish came from my own little herb garden! 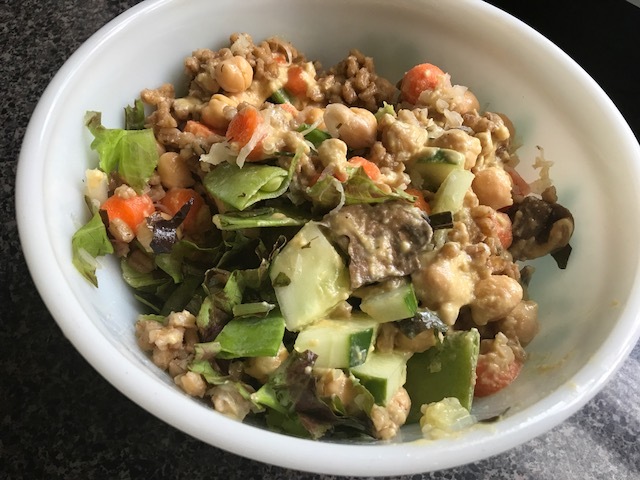 I wanted to share that easy Mushroom Barley Pilaf recipe because it was delicious and so easy to make. Combine the barley and broth in a large stock pot and bring to a boil. Cover and lower heat to simmer. Simmer for 50-60 minutes. While the barley cooks, add about 1/4th cup water and onions in a non-stick skillet. Saute 3-5 minutes or until onion is soft. Add the garlic and saute one more minute. Add a little extra water if the water dries up completely or if veggies are sticking to the pan. Add the mushrooms and saute about 5-7 minutes or until mushrooms are soft. Season the mushroom mixture with a dash of Bragg's (or soy sauce) and fresh herbs and black pepper. Remove from heat. When the barley is done cooking, stir in the mushroom/onion mixture. Serve! Y'all tired of these "stuff I ate" posts yet? Too bad! Here's another. But I promise something a little different tomorrow. On Sunday, Paul, Misti and I had lunch at Hopdoddy in Overton Square. I've been there a few times, and I always get the Impossible Burger because it's delicious. But I've had the Impossible quite a bit lately, so I decided to try the La Bandita Burger (a black bean and corn burger), ordered vegan-style with vegan mayo and Field Roast Chao Cheese. Delicious! It has that crumblier quality that bean-based veggie burgers have, but that's okay. It tastes like a true bean burger (amazing flavor!). I felt a little healthier eating this, though I did have a number of their Kennebec fries and an 18-ounce Meddlesome Brewing Co. 201 Hoplar beer. Here's something WAY healthier! Yesterday's lunch was a Giant Salad with chickpeas, leftover barley-mushroom pilaf (more on that tomorrow), carrots, cucumber, snap peas, kraut, lettuce (from my CSA! ), and oil-free tahini dressing. 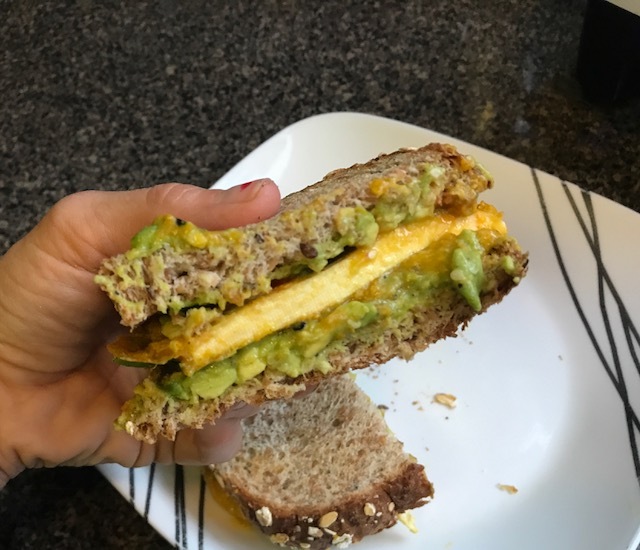 Breakfast this week — when I'm not having smoothies — has been Tofu Egg & Avocado Breakfast Sandwiches. I've been pan-frying slabs of tofu spread with Vegg yolk (made with Vegg powder), and then I put those onto a sandwich with mashed avocado, sriracha, and sprouted grain toast. Yum! Messy since the Vegg yolk and avocado are both soft, spreadable things, but so tasty. I've just started training for the Stanky Creek 50K (!!!! ), so I'm now doing back-to-back long runs every Saturday and Sunday. 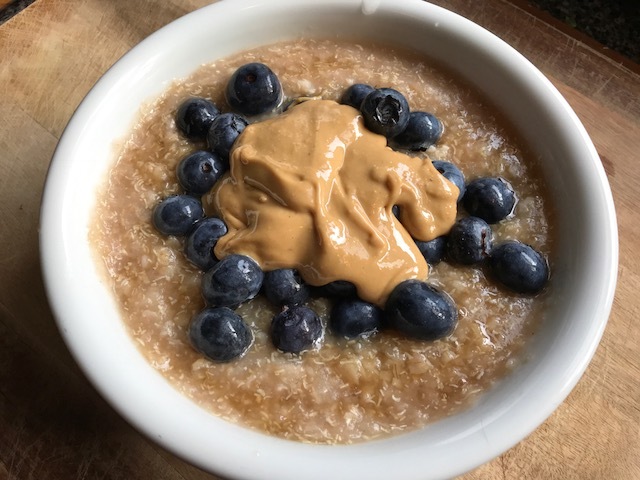 This weekend was the first weekend of training, so I did an 8-mile run on Saturday morning after this bowl of Oatmeal with Nectarine, Maple, & Nuttzo nut & seed butter. And on Sunday, Paul and I ran 6 miles together. But first, I had a Nature's Valley Maple Pecan Oat Cup with Nectarines (from my CSA!) and Cashew Butter. Oats are my fave pre-long run food! It's a new week, but I'm still working on posting pics of meals from the past couple weeks! Also, you may have noticed (or not!) that I didn't post on Sunday night. I've traditionally posted Sunday-Thursday (except when I was on vacation or had holiday stuff happening) since the blog began in 2007. But I'm thinking about switching to a Monday-Thursday schedule going forward. I often find that I'm just too busy having Sunday Funday to post! Hope that's okay. Anyway, without further ado, here are a few more random meals. Last Monday, Paul and I had dinner at Mulan in Cooper-Young because I had a Groupon. But turns out, that Groupon was only for the East Memphis location!! Boo! Oh well, the food was good. We started with Tofu Spring Rolls. And then we shared an order of Panang Curry with Tofu (ordered without fish sauce). Brown rice for me, white rice for him. This was actually enough for THREE MEALS!! On Tuesday night, my entire office at Crosstown Arts took a field trip (by chartered bus!) to the West Memphis Pancho's for a going-away party for our co-worker Sadie. Pancho's is totally a Memphis thing (even though the best location is in West Memphis, Arkansas). It's a Tex-Mex joint best-known for its legendary cheese dip, which is available in just-about every grocery store in Memphis. I can't eat it anymore, but if I could cheat on my veganism with one thing, it'd be Pancho's cheese dip. Of course, I won't do that. But thankfully, there are a couple of veganizable options at Pancho's. I typically get the Spinach Mexican Pizza with no cheese, but they were out of Mexican pizza shells. So I went with the Nachos, minus the cheese, beef, and sour cream. The beans are vegan, according to several servers I've asked over the years. Sorry for this terrible flash pic, but it was dark in there! We enjoyed dinner and drinks, plus HOURS of karaoke. Great party! The next day, much of the office was a little hungover. Ha! Including myself (damn margaritas). Thankfully, I can walk downstairs from my office and get fresh juice at Juice Bar. This We Got the Beet Juice made me feel much better. Thursday was Summer Solstice. And it was also National Smoothie Day! I started with a short two-mile run and followed it with a Berry-Orange Protein Smoothie (strawberries, raspberries, OJ, almond milk, & vanilla protein powder). More random pics tomorrow, y'all! Back again with more random meals (and expect more posts like this next week!). This plate of deliciousness came from Krewe of Deja Vu, the new name for the old Deja Vu Creole & Vegetarian Restaurant. Deja Vu moved from Front Street back to its original location on Florida Street (which Memphis vegans will recognize as the former home of Pink Diva Cupcakery). Susan and I checked out the new (old) place for lunch last week. I got the Teriyaki Tofu with Collard Greens and Smothered Okra. Vegans, never fear — the name and location have changed; the menu has not. Still the same amazing vegan soul food options. After lunch, Susan and I grabbed some ice cream from downtown's Margie's 901. She'd been there earlier in the week and discovered they had vegan ice cream! This is a regular dairy-filled ice cream joint, so I was super impressed that they had Vegan Pistachio Ice Cream. When you order there, you get one mix-in, so I chose almonds. Perfection! I've been doing fairly well on my mission to eat oil-free, veggie-based meals most of the time (except for the occasional fried tofu!!!). But I'm struggling with sugar these days thanks to Maria, who works at our soon-to-open plant-based cafe at Crosstown Arts (where I work). Maria has been testing vegan desserts on the office almost daily! Which is awesome and also hard! Twice this week, she's made Vegan Pop-Tarts (today, she made chocolate cookies). These were Blueberry Thyme Pop-Tarts. I feel like I have to sample everything (for work, you know). Here's a Savory Oat Breakfast Bowl from last week. The steel cut oats are seasoned with nooch and garlic powder, topped with sauteed mushrooms and seitan bacon. And sriracha! And finally, here's a snack-sized bag of Himalayan Salt & Apple Cider Vinegar Paleo Puffs! These were in my June Goddess Provisions box. 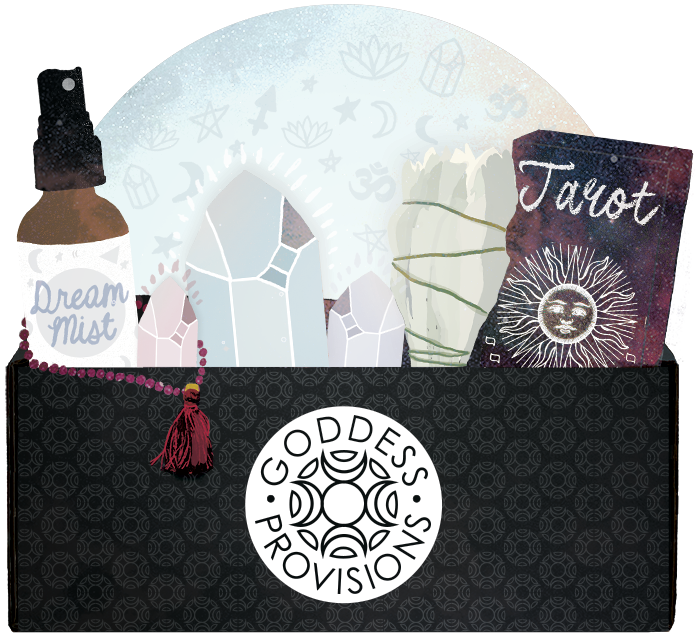 I've slacked on my Goddess Provisions posts, but I'm still loving these monthly boxes. These puffs were AMAZING! Have a great weekend! I'll check back in with more meals on Sunday. I'm amassed lots of random meal pics since I've been back from Bonnaroo, so I'll be sharing them in a series of Stuff I Ate posts that'll probably go through early next week! Let's get started! The first full day back in Memphis after our 4-day Bonnaroo camping trip, I was craving something hearty and wholesome. Four days of chips, tots, and beer will do that to ya! Fortunately, I had the foresight to start a crock pot of Southern-Style Soup Beans the night I arrived back in town. I added a little onion and garlic and cooked these white beans on low for hours! 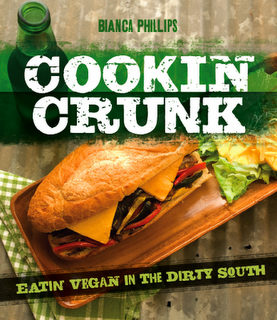 Plus, I made the Kickin' Corn Muffins (oil-free, gluten-free) from The Engine 2 Cookbook and some Sauteed Collards (from my CSA). I had a lot of blueberries left after Bonnaroo since I bought some for my breakfasts at the campsite, so I worked them into my breakfasts at home. Like this bowl of I Heart Keenwah Toasted Quinoa Hot Cereal with Cashew Butter & Blueberries. 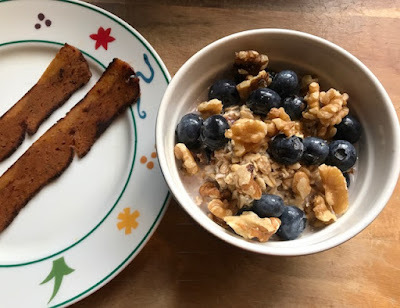 One morning, I had a Quaker Blueberry Bliss Overnight Oats Cup (transferred to a real bowl) with extra walnuts and berries, plus a side of Be-Hive Seitan Bacon. After a run one day, I had a FitQuick Orange Cream Bar Protein Waffle with Blueberries, Walnuts, & Maple Syrup. I've been LOVING my CSA and using everything I get each week! I got some broccoli in the bag a couple weeks ago and used it in this Teriyaki Soy Curl Broccoli Bowl. The broccoli was steamed, and the Soy Curls were sauteed with low-sodium soy sauce and maple syrup. Served over quinoa. Totally oil-free! 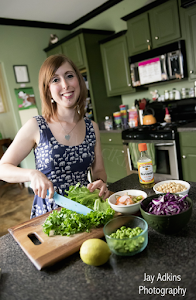 I've been eating oil-free at home, and I'm loving it. Check back for more randomness tomorrow! 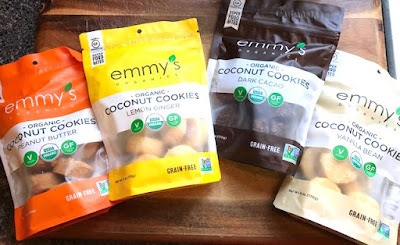 Emmy's Organics sent me a few packages of their Organic Coconut Cookies to review! I've had a couple flavors before in past Goddess Provisions boxes, so I was excited to try more flavors. These are essentially raw coconut macaroons, and they're made with just a few ingredients — coconut, agave, almond flour, and natural flavors. And every ingredient is organic and gluten-free and, of course, vegan! They sent me Peanut Butter, Lemon Ginger, Dark Cacao, and Vanilla Bean. Of course Peanut Butter is my fave. These taste like a healthier version of Chick-o-Sticks! My next fave would be the Lemon Ginger, which has a very pronounced lemon flavor with just a hint of ginger. The vanilla bean and dark cacao are great too! Since these are around 100 calories each, they make perfect little snacks before my 5:30 am shorter morning runs. I take in more calories for a longer run of course, but for anything less than 3 miles, about a 100 calorie snack is all I need. Of course, they also make perfect little afternoon dessert pick-me-ups! And it's a dessert you can feel totally great about! 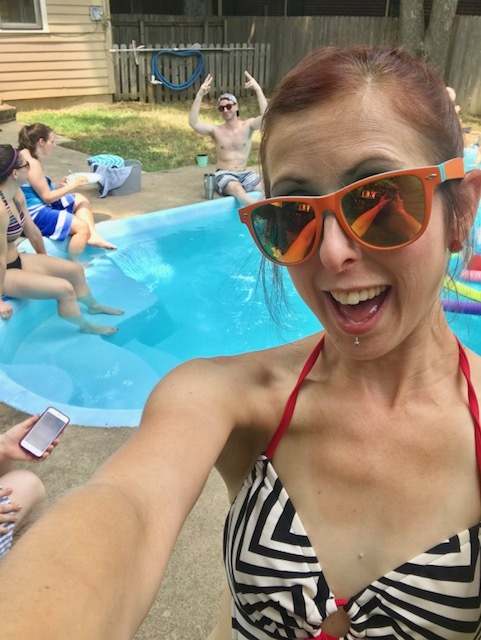 This past Saturday was the second annual Vegan Drinks Pool Party! Members Melissa & Anthony started this tradition last year by opening their lovely home for a pool party and taco potluck, and this year, they opted for a brunch theme. So that means we started drinking at 11 am! Yay brunch! We had plenty of mimosas and beer-mosas, so we're probably all well-fortified with Vitamin C now. As for the food, we had so many delicious breakfast dishes. 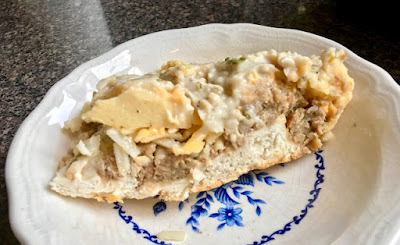 I made my mom's veganized Biscuits & Gravy Casserole. This has layers of canned biscuits (Pillsbury Grands are vegan), vegan sausage (I used Gimme Lean), vegan cheddar (I used Daiya), hash browns (frozen shreds from a bag), scrambled Vegan Egg, and white country gravy. 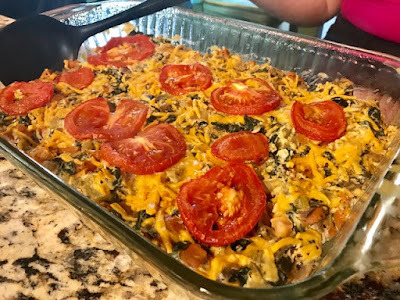 By contrast, Jennifer made a much healthier casserole that was like a Baked Tofu Scramble Casserole with vegan cheddar, kale, and more veggies. Very good! Probably the best tofu scram I've ever had (she used a recipe by JL Fields). Hosts Melissa & Anthony made Breakfast Tacos! With vegan sausage/peppers/brussels sprout saute and tots! Tacos with tots are always a winner. 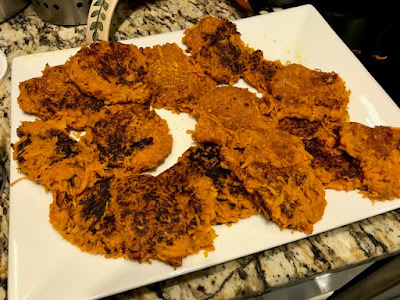 Steven made Sweet Potato Pancakes using grated sweet potato. They were slightly sweet but also savory and wonderful topped with vegan sour cream. For dessert, Megan made a scrumptious Berry Cobbler with a biscuity topping. She brought vanilla soy ice cream for serving. Perfection! Melissa & Anthony made Air-Fried Doughnuts!!!! These blew my mind, and I will most definitely be making these at home soon in my own air fryer. They used canned biscuit dough for the doughnuts and just brushed them with a simple icing. I'll have to get her recipe, try them, and share with y'all soon. Another pool party come and gone! We had a blast and hung out in and around the pool until about 4 pm. Can't wait until next year! My parents came down from Jonesboro today for a Father's Day outing at Crosstown Concourse — the awesome building where I work and spend most of my free time. My dad had seen me post about the Impossible Burger at Farm Burger in Crosstown Concourse, and he said he wanted to try it. So we had vegan burgers! My dad and mom both loved the Impossible! My mom even said it was better than a meat burger. Here's an inside shot of my Impossible Burger. I ordered it medium rare this time, and it had just the right amount of pink inside. I LOVE this burger so much. For my toppings, I went with housemade pickles, red onion, tomato, lettuce, grainy mustard, and pickled jalapenos. 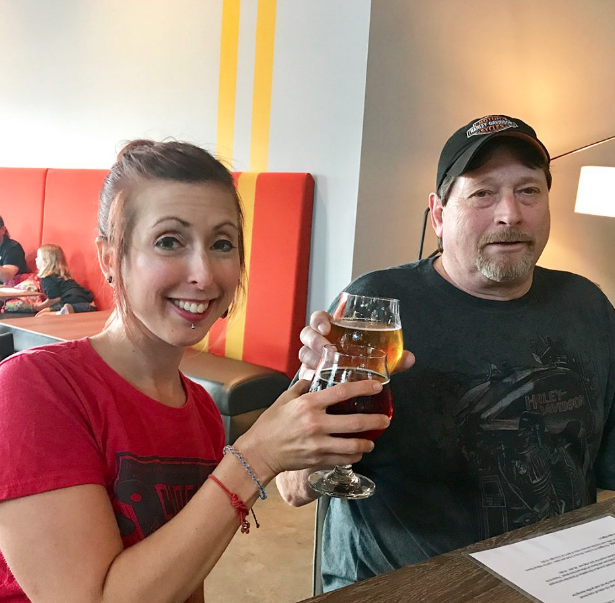 After lunch, we walked down to the far west side of Concourse for beers at Crosstown Brewing Co. My parents had yet to check out our local brewery, so this was fun! I got the Alt School altbier, and they got Siren Blonde Ale. Paul went with the high-grav Russian Imperial Stout. I love my dad so much! He's the coolest guy I know — super generous, silly, and badass all at the same time. Definitely won the dad lottery in life and I'm super grateful. 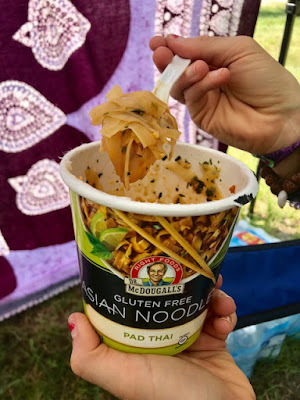 I ate many delicious vegan meals at Bonnaroo Music & Arts Fest last weekend (read all about them here!). But one meal stole my heart - the Philly Beet Steak from The Beet Box food stand. It was just what it sounds like! A Philly cheesesteak made with beets, topped with peppers and onions, a creamy cashew cheese, and slices of avocado. I couldn't wait to go home and re-create the meal with the beets from last week's CSA. The recipe is super-simple, but it so satisfying. And it fits in with my current efforts to fit as many veggies into my diet as possible. My version is made with whole wheat bread for a healthier spin, but The Beet Box used a soft white roll. Do what you want! Roast the beets in a 400 degree oven for about 30 minutes or until fork tender. While the beets are roasting, add the onion, mushrooms, and bell pepper to a large skillet with enough water to cover the bottom of the pan. Add as much Mrs. Dash, garlic powder, and salt and pepper as desired. Saute on medium-high, adding more water as necessary to prevent the veggies from sticking. Once they're soft, allow the water to dry up and continue to saute for a couple minutes, stirring often, to allow the veggies to brown. To make the cashew cheese, combine the cashews, 1/2 cup water, garlic, sea salt, and nutritional yeast in a blender. Blend until smooth. You may need to add more water one tablespoon at a time to reach desired consistency. You want a thick but pourable cheese, like a sauce. To assemble, spoon half the beets into the roll and top with half the pepper/onion mix. Top with as much cashew cheese as desired and finish with avocado slices. Yesterday, I shared all of the delicious eats (and musical highlights) enjoyed inside Centeroo, the festival grounds at Bonnaroo Music & Arts Fest last weekend in Manchester, Tennessee. Tonight, I've got a round-up of stuff I ate at our campsite. 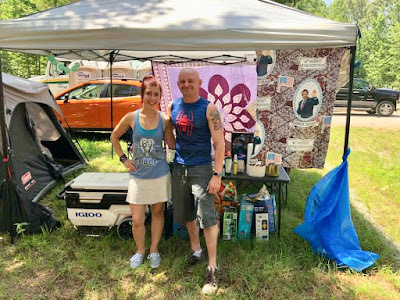 We stay in Guest Camping every year, which is quite a step up from Bonnaroo's General Camping area. It's reserved for artists and press, and the entire campground is shaded (there are no trees in general camping). Plus, we get free showers, and there are some cool perks (like air-conditioning and wifi) in the nearby media tent. Soooo grateful for guest camping! Here we are after setting up camp. You can see my shiny orange Subaru Crosstrek in the background. Her first roadtrip!! Also, check out our Obama tapestry that we found on the ground at Bonnaroo last year. Ground score!! I wish I was one of those campers who cooked amazing, rustic meals every night. But I'm not. I'm a convenience camper, and most of my meals consist of oat cups and soup cups. I bring a camp stove for boiling water for my cups. But I try to work in some fresh fruit and veggies too. Breakfast most mornings was oat cups with nut butter packets and fresh blueberries, which I picked up at the Manchester, TN Walmart when we arrived in town. I used to bring instant coffee and boil hot water on my campstove to make coffee, but who wants hot coffee when it's 90 degrees outside? These days, I pack cold brew and little boxes of soymilk to make iced coffee. Lunches were typically soup or noodle cups, like these Dr. McDougall's Pad Thai Noodles. And this Dr. McDougall's Tortilla Soup. The soup cups are usually 200 calories or less, which does not make a meal. So I supplemented with big ole salads! I had lots of lettuce in my CSA, which I picked up on Tuesday before we left. I packed the mixed baby greens in our cooler, and I picked up a can of chickpeas, some chopped cauliflower & carrot "rice" blend, and some Just Ranch dressing at the Walmart when we got there. I made salads like these every day! Nothing is more refreshing on a hot day outside than a cold salad with vegan ranch. I also kept some hummus and baby carrots in our cooler for snacking, but I didn't get pics. Ooh, and let's not forget my Sunday morning breakfast, which wasn't oats but Dr. McDougall's Vegan Chicken Ramen!! As for snacks, I had trail mix, Earth Balance popcorn, I Heart Keenwah puffs, Kettle Bourbon BBQ chips, Bugles (!!! ), and some homemade Cheesy Kale Chips that I made in the dehydrator at home before I left. I used my CSA kale for these! I love that I was able to use most the CSA veggies that I worried might go bad while I was gone! All in all, I feel like I ate pretty well at the campsite this year. Made up for all that fried goodness I bought out in Centeroo.